While churches aren’t for-profit businesses, religious institutions can still promote themselves using marketing tactics that have been proven in the business world. Churches aren’t in the business of selling, but they can use flyers to spread the word about church-related events. The templates you’ll find on this page suit various purposes, including everything from detailing a church’s weekly schedule to announcing upcoming concerts. You can also build your own resume. One answer to this need is flyers. Marquees can speak to passersby, and bulletin boards can inform people who are already parishioners. 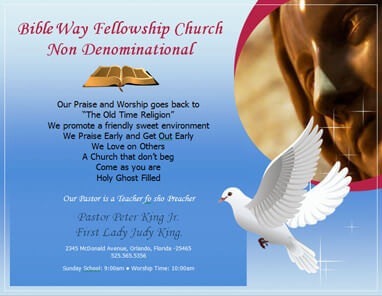 But flyers can announce upcoming events and issue invitations beyond the walls of the church. Various designs on this page offer a range of looks, but they all make it clear that a religious organization is involved. A large image of Jesus in front of a sunlight “ray of hope” provides an encouraging, peaceful feeling to this template, so it makes a perfect advertising flyer for inviting people to a Bible study or other church event. To get your message across clearly, make sure you adopt best practices when designing your flyer. Do: Use the flyer as a starting point. You don’t want a flyer crammed with text, so if you have a lot to say, put the most important information on it and then include a website address so that people will go online to get the remaining facts. Make it clear that they should go to the site by using a phrase like “Read more at our website,” “Get more details at our church website,” or something similar. Do: Make the most important information highly visible. If your event is a concert, make sure the words “Concert” or “Gospel Concert” are the biggest on the flyer. People should be able to quickly understand what you’re announcing. Don’t: Simply rely on a graphic to get your point across. While people recognize religious symbols like images of Jesus, crosses and doves, you still must include necessary information because an image won’t clearly convey your message. Attractive graphics are a backdrop and add to your theme, but you have to use the right words so that people know what you’re promoting. Don’t: Use complicated or overly religious jargon. Christian flyers can attract church members, but they may also reach non-members or church visitors. Anyone who’s not familiar with church teachings or services may be put off by confusing language. To make it easy to customize your chosen template, each of these free flyers is editable in Microsoft Word. Downloading a template is an easier and quicker way to create a flyer than designing one from scratch and having to locate images to use. Once you download your template, open it in Word and add your own text. You can adjust placement as needed to create the exact look you want. The following templates make it easy for your church to promote special events, inform members and non-members of your regular Sunday schedule, issue invitations to Bible study, and tell everyone about upcoming gospel concerts or events such as vacation Bible school. You can customize the templates to include all the information you think is needed. 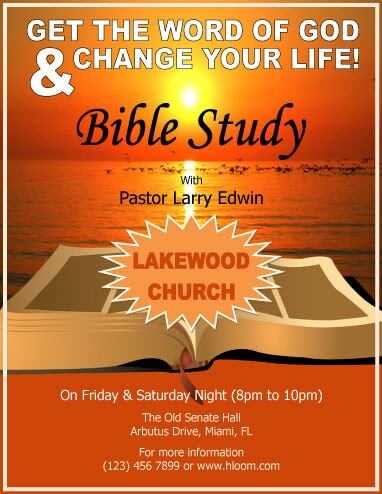 The elegant graphics and color scheme on this church flyer template make a beautiful background for announcing Bible study events. Feel free to customize it for other church-related occasions or causes. 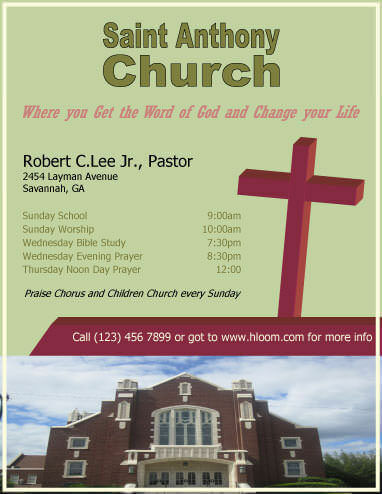 Peaceful, religious graphics make this flyer a wonderful way to invite people to Bible study or any other church event. With images on one side of this template, you have plenty of open space to place your information. The sunset graphic design on this flyer allows you to use it as a general bulletin for making announcements of upcoming special events, so feel free to use it as a church anniversary flyer or even as a gospel concert flyer. This free church flyer template can be used to promote a variety of events or announcements, from a general church service schedule to Bible study. Customize it with your church name, church photo, address, website address and phone number so that people can easily find you. This peaceful template design with a background image of a praying child is a wonderful way to announce any church-sponsored event, from special functions featuring guest pastors to weekly prayer meetings. 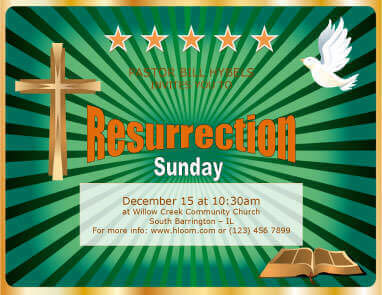 Use this church flyer design template as a way to give details about Resurrection Sunday service times and locations. You could also use it to promote other church events such as Bible study or use it as an Easter flyer. The fun and whimsical graphic design on this free church template is perfect for giving everyone the heads up about vacation Bible school. It’s also kid-friendly enough to work for children’s events like birthday party celebrations. This general-theme event flyer template is a great way to invite people to Bible study. You can customize it to be non-denominational or to promote your particular religious denomination. Religious symbolism makes it clear that this church flyer template is announcing a church-sponsored event. 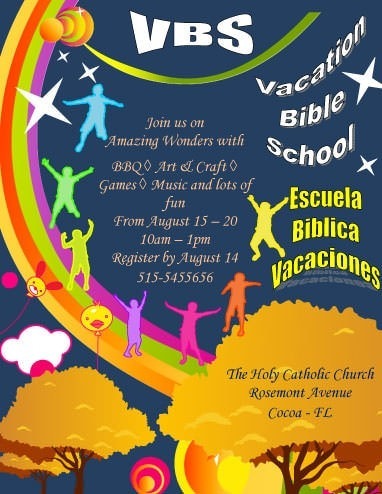 Use this flyer design for vacation Bible school and other church activities. A background of sun rays and flowers makes this flyer design engaging and inviting. It’s a great way to announce Bible camps or other kids’ events such as home or school parties. Here’s a unique way to tell your congregation and others about your upcoming vacation Bible school schedule. You can modify this colorful template to announce other youth-related church events, as well.